have published a wonderful A3-sized Wolf calendar for 2016, packed with beautiful wolf pictures. It can be ordered from: Nolia Meyer (nolia@pentasure.ws) at the cost of just R 50.00 plus postage. Proceeds go towards the sanctuary. Get yours NOW before stock is sold out!!!! Without firing a shot, two U.S. Senators may be about to trigger the death of hundreds of wolves. Sens. Ron Johnson (R-WI) and John Barrasso (R-WY) have introduced a bill that would forcibly delist gray wolves in Wyoming, Michigan, Minnesota, and Wisconsin. Without the protections of the Endangered Species Act, hundreds of wolves, including mothers and pups, will die. We’re fighting tooth and nail to stop these horrific attacks, and we need your help. Because the situation is so serious, our Board of Directors and National Council offered to match your gift dollar-for-dollar, up to a total of $75,000, until Monday, November 23rd! By introducing this bill just before final negotiations take place over the 2016 federal budget, Senators Barrasso and Johnson are hoping to encourage the inclusion of delisting language into a must-pass budget bill. If that happens, how long do you think it will take for more wolves to be killed? To add insult to injury, the bill would also prevent federal courts from ever restoring Endangered Species Act protections for these wolves, no matter how bad the situation gets! With federal protections gone, most of Wyoming will immediately be re-designated a “predator zone,” literally a free-fire zone where anyone could kill any wolf at any time and for any reason. With your help, Defenders will mobilize our grassroots community to oppose this blatant abuse of Congressional power, reach out to the media to spread the word and continue to fight on Capitol Hill against this deadly bill. Thanks to you, we’ve been leading the charge for wolf recovery since wolves were first reintroduced into the Lower 48, more than 20 years ago. With your support, we’ve gone to court and won repeatedly to make sure wolves get the legal protections they deserve. 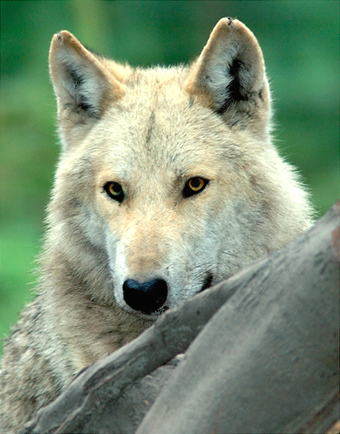 We’re pioneering new, non-lethal strategies for wolves to coexist with people and livestock. 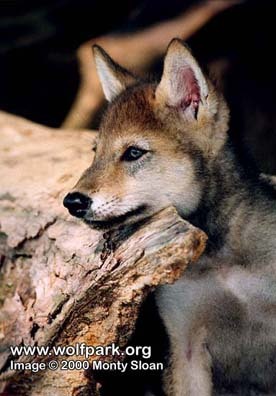 With you at our side, we’ll weather this current crisis and look forward to a day when wolf recovery is truly complete! The wildlife you love is counting on you to help. Are you in? The level of cyanide poisoning is getting out of control. The poachers are poisoning water holes in the hope of killing elephants for their tusks but the problem is, many different species of animals drink from the water holes and are poisoned. The tally for the past two months is 103 elephants have been poisoned and one shot. The army has been called in but there is no change. The syndicates are well informed and all National Parks are under threat. Many different species have been poisoned such as vultures, turtles, sable, eland, giraffe etc. We have recently lost 9 wild dogs to poisoning and the worry is that they may have puppies. If this is the case, the puppies will also die without their mothers to feed them. In Mongwe, 19 buffalo have been poisoned near a water hole. The authorities have arrested a couple of people in connection with this, but the problem is very serious and the lack of rain is making it worse. We are very disheartened at the way the perpetrators are not thinking about future generations. This could take months or even years to solve. If we could get drones, this might be a solution. If anyone would like to see photos, let us know. Mark Rowland worked as an assistant professor of philosophy at the University of Alabama, in Tuscaloosa. 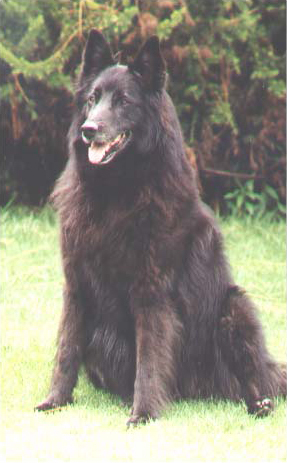 He had grown up with dogs, mostly large breeds like the Great Dane, and he missed them. 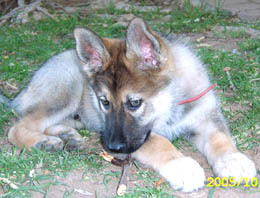 One afternoon, he found himself looking through the Wanted section of the Tuscaloosa News, looking for a suitable dog. 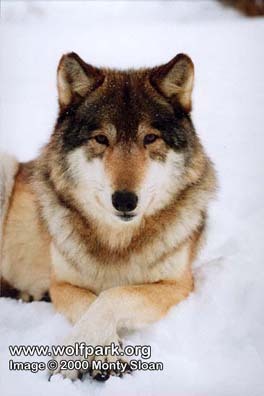 Since the United States of America pursued a policy of systematic eradication of its wolves, there were virtually no free wild wolves living in the contiguous 48 states. But after that the policy had been abandoned, they wolves had started to make a comeback in parts of Wyoming, Montana and Minnesota, and on some of the islands in the Great Lakes. They had even been reintroduced, over the strident protestations of ranchers, into the most famous of US natural parks, Yellowstone. 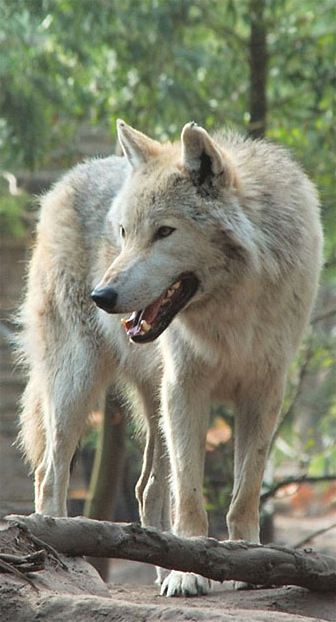 This resurgence in the wolf population had not yet reached Alabama or the South in general. 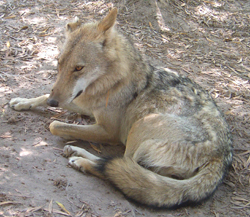 There were lots of coyotes and a few Red wolves in the swamps of Louisiana and east Texas, although nobody was really sure what they were, and they could have well been the result of historical wolf-coyote hybridisation. 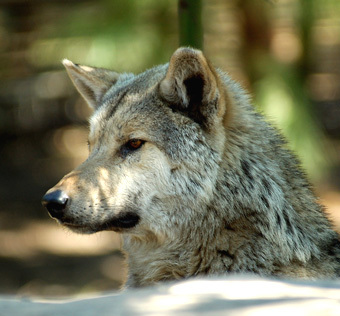 Timber wolves, or Grey wolves, were a distant memory in the southern states. Therefore, Mark was somewhat surprised when his eyes caught an advertisement: WOLF CUBS FOR SALE, 96 CENTS EACH. After a quick phone call, he jumped into his car and headed to Birmingham, about an hour to the northeast, not entirely sure what he was expecting to find. A while later he came eye to eye with the biggest wolf he had ever heard of, let alone seen. The owner had shown him around to the back of the house, and the stable and pen that housed the animals. 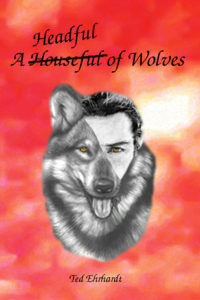 When the male wolf, Yukon, heard them coming he jumped up at the stable door. He was huge and imposing, standing slightly taller than a man. Mark looked up at his face and in his strange yellow eyes. But it was his feet he will always remember. 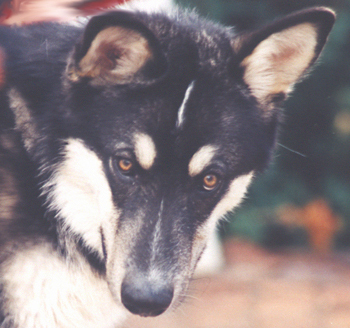 Wolf paws are much larger than those of dogs, and it was his paws that announced Yukon’s arrival. The first thing Mark saw as he bounced up to lean over the stable door, was these furry feet, much bigger than Mark’s fists. Mark had never been afraid of dogs, and this transferred naturally to wolves. He greeted Yukon in the way he would an unfamiliar Great Dane – relaxed and friendly, but nonetheless observing the standard protocol. 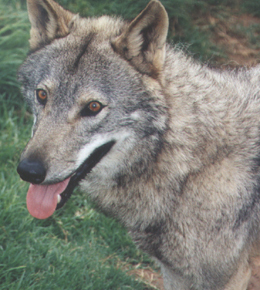 Yukon turned out to be a good-natured wolf, confident and outgoing. He let Yukon sniff his hand, and petted him at the front of his neck and chest until he became used to him, and the two got on like a house on fire. The she-wolf, Sitka, was as tall as Yukon, but far rangier and nowhere near as massive. 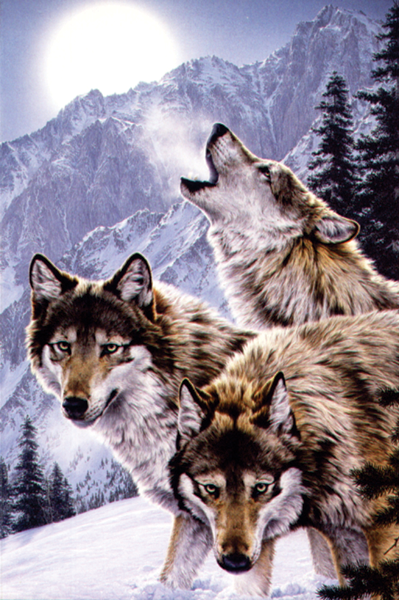 She looked more like one of these perfect picture postcard wolves, long and lean. 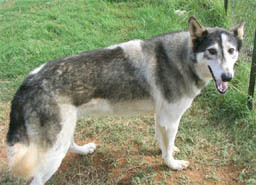 Sitka was an Alaskan tundra wolf. 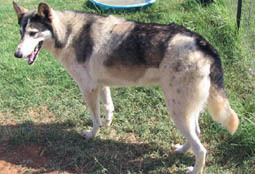 Yukon, on the other hand, was a McKenzie Valley wolf, from the northwest of Canada. Sitka was far too preoccupied with the six little “bears” that were running around her feet to pay Mark much attention. They were round and soft and fluffy, with no sharp edges. Some of them were grey and of them brown; three males and three females. Mark actually had come only to look at the cubs, then go home and think carefully and soberly about whether he was ready to take on the responsibility of owning a wolf, and so on. But when he saw the cubs he knew he was going to take one home – today. Picking the right cub was easier than he had thought it to be. First of all, he wanted a male, and there were three of those. The biggest male was a grey one that was clearly going to be a mirror image of his father. Mark knew enough about dogs to realise that this one was also going to be a challenge. Completely fearless, energetic and dominating his brothers and sisters, he was destined to be an alpha and would take some controlling. Mark therefore picked the second-largest cub from the litter. 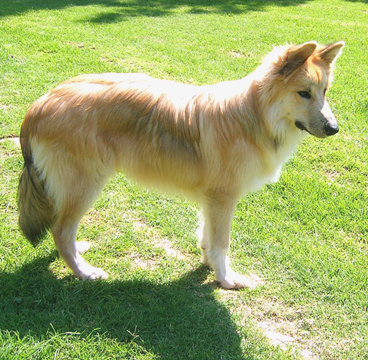 He was brown and his colouring reminded him of a little lion cub. He named him Brenin: the Welsh word for king. 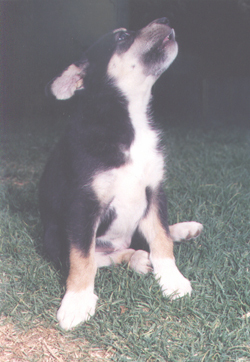 Six weeks old at this time, Brenin was brown flecked with black, but with a cream underside that ran from the tip of his tail up to the bottom of his snout, and he had big feet, large-boned legs, and a big head. His eyes were very dark almond, bordering on honey. Mark wouldn’t say he was “friendly”, at least not in the way puppies are friendly. He was also not enthusiastic, or eager to please, but rather suspicious, and this was something that would never change towards anyone except Mark. Mark can still remember all these things about Brenin and Yukon and Sitka, how he was holding Brenin up to his face and looking in his yellow wolf eyes, the way he felt, with his soft cub fur, between his hands as he held him, and he can still picture clearly Yukon standing up on his hind legs, staring down at him, big feet hanging over the stable door. He can still picture Brenin’s brothers and sisters running around the pen, tumbling over each other and jumping back to their feet in glee. But he has virtually no memory of the person who sold Brenin to him. That was the start of a process that would become more and more pronounced as the years rolled on – he started to tune out human beings. When you have a wolf, he will take over your life in a way that a dog seldom does, and human company gradually becomes less and less significant. It was bright Alabama evening, in early May, when Mark brought six-week old Brenin into his house and his world. Within two minutes of his arrival Brenin had pulled the curtains in the living-room (both sets) off their rails. While Mark was trying to save the curtains from total destruction, Brenin found his way out into the garden and under the house. In the rear, the house was raised off the ground and you could access the area below by way of a door built into the brick wall, which Mark had left ajar. Brenin made his way under the house and then proceeded in a very methodical, meticulous, and overall quick way to rip down every single one of the soft, lagged pipes that were connected to the air-conditioning unit and ran to various vents in the floor. This was Brenin’s trademark attitude towards the new and unfamiliar. He liked to see what was coming. He would explore it, embrace it, and then trash it. After his initial destructive surge, which lasted about 15 minutes or so, Brenin went into deep depression, making himself a den under Mark’s desk and refusing to come out or eat. This lasted a couple of days. Mark assumed he was mourning the loss of his brothers and sisters, and he felt very sorry for him, and also very guilty. He now wished he had brought a brother or sister to keep him company. Within a day or two, Brenin’s mood began to lift, and with it the first rule of their mutual accommodation became clear – Brenin was never, ever, under any circumstances, to be left on his own in the house. Failure to abide by this rule involved dire consequences for the house and its contents. The fate of the curtains and the air-conditioning pipes was merely a gentle warning of his true capabilities in this regard. These included destruction of all furniture and carpets, with a soiling option also available for the latter. 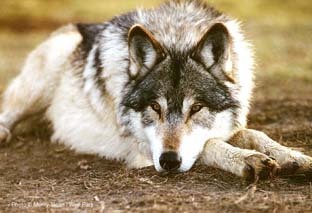 Wolves get bored very, very quickly, and about 30 seconds of being left to their own devices is generally long enough. When Brenin got bored he would either chew on things or urinate on them, or chew on things and then urinate on them. That all boiled down to wherever Mark went Brenin had to go, too. During the summer, Brenin had grown and turned from a chubby little cub into a long, lean and angular 6-month old of 75 cm at the shoulder, weighing around 37 kg. His colour had remained the same: brown, flecked with black, with a cream underside. 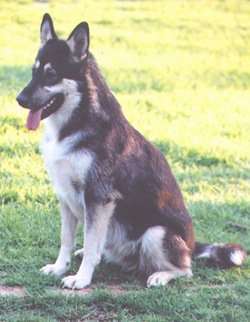 He had inherited the big snowshoe feet of his parents, and always gave the impression that he was about to trip over them, and there was a black line that ran down the dorsal edge of his snout, from his forehead to his nose, framed by his eyes, still the colour of almond and now showing the hooded, slanting shape of a wolf’s. During the summer months, Mark and Brenin would go on long outings, and the moment Mark said, “Let’s go,” Brenin would perform his party piece: a cartwheel against the living room wall by jumping on the settee, then continuing his run up the wall, and when he had gotten as high as he could, he would swing his back legs up and around, then run back down the wall. In late August, Brenin and Mark went to the University of Alabama for our first class together. After he had become used to there being other people in the room, he would lie down under the desk go to sleep. When he woke up he started to attack Marks sandals, which seemed to be a distraction welcomed by every student in class. Things didn’t always go so smoothly, however. After a few weeks, Brenin started to enjoy a post-nap howling session halfway through the class. At other times, he would decide to stretch his legs, wandering up and down the aisles, sniffing around, and one day Mark I saw his head disappearing in the backpack of a female philosophy major, only to emerge with her lunch a few seconds later. 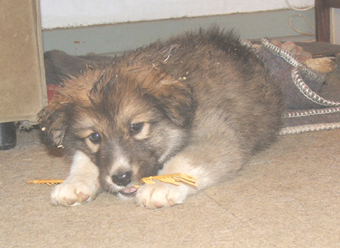 When Brenin was still a young wolf, his favourite game was to steal cushions off the sofa or the armchair. He would then appear at the door, cushion in mouth, and, when he knew Mark had seen him, he would tear off through the house and out into the garden, with Mark in hot pursuit. The game was one of chase and could go on for quite a while. Mark had already trained him to drop things, so he could have ordered him to drop the cushion at any time, but he didn’t have the heart and, anyway, the game was much more fun. Until he was about three months old, Brenin was quite easy to catch, but soon he was throwing Mark little shimmies, feinting to go one way while actually going the other. When Mark caught on to this trick, the shimmies would become double shimmies, and eventually the game was played in a confused blur of feint, double feint and triple feint. He once played the same game with a freshly cooked chicken that he had stolen from the kitchen when Mark was not watching. Of course, Mark could have told him to drop it, but what was the point? Mark really didn’t fancy the chicken after it had been in his mouth, and so they played the game of chase. 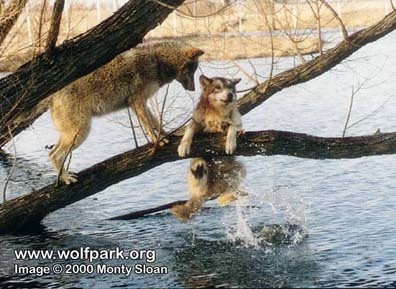 Some professional animal trainers told Mark that this game by its nature was likely to make Brenin more excitable, which was not a characteristic you wanted to encourage in a wolf. And that Mark’s failure to catch Brenin might have led him to the conclusion that he was physically superior to him, and therefore caused him to bid for alpha status. Maybe these were legitimate worries, but they never materialised with Brenin. Mark thinks that the reason for this was that the games always proceeded according to a well-defined ritual that had a clear beginning and end. When Mark was in the living room, he never allowed Brenin to take the cushions. His attempts to do so were met with a firm, “Out!”, which told him that the game was something that could only be played at certain times. And the games always came to a definitive conclusion when Mark would say, “OK, that’s it!”, make Brenin bring the cushion back and drop it. Then they would go inside and Brenin received a treat of some sort, which both reinforced the end of the game and made him associate this ending with something good. This all worked well for a while, but when Brenin was around nine months old, he decided to take the game to the next level. One morning, while Mark was writing in his study, he heard a succession of loud thuds from the living room. Brenin had decided it might be a good idea to take the armchair out to the garden, and the thuds were caused by his repeatedly banging the chair against the door frame as he tried to drag it through. That was when Mark realised that a more radical approach towards Brenin’s entertainment was required, and that was that it would be best for both if Brenin were constantly exhausted. And so they began running together. Well, that approach was not really a good one. Surely, the runs tired Brenin out initially, but Mark too, but as he was not the one trying to drag furniture out to the garden, that was of lesser importance. Brenin became fitter and fitter, and therefore ever more capable of wreaking havoc on the house and its contents at any given time. Soon, runs that used to plunge him into an exhausted slumber for the rest of the day turned into a walk in the park for him, and therefore the runs became longer and longer, and Brenin got fitter and fitter as a result. Still they kept running, and both got fitter, and leaner, and harder. This pragmatic impetus for Mark’s new-found fitness, however, quickly changed into something else. On their runs together, Mark realised something both humbling and profound: he was in the presence of a creature that was, in most important respects, unquestionably, demonstrably, irredeemably and categorically superior to him, and this was a watershed moment in his life. He had never felt this way before in the presence of a human being, and he realised that he wanted to be less like himself and more like Brenin. When they were running, Brenin would glide over the ground with an elegance and economy of movement Mark had never seen in a dog. A wolf uses its ankles and large feet to propel it forwards, and as a result, there will be far less movement in its legs, which remain straight, and move forwards and backwards but not up and down. When Brenin trotted, his shoulders and back remained flat and level. From a distance it looked as though he was floating an inch or two above the ground. When he was especially happy, or pleased with himself, this would be converted into an exaggerated bounce. Mark will never forget the picture of the wolf in the early-morning Alabama mist, gliding effortlessly over the ground, silent, fluid and serene. The contrast with the noisy, puffing and lead-footed thudding of the ape in the shape of Mark that ran beside Brenin could not have been more pronounced or depressing. Mark wanted to be able to lope, to glide over the ground as though he too was floating an inch or two above it, but no matter how good at running he became, this was always going to escape him. One afternoon Mark decided to go for a run and, uncharacteristically, leave Brenin behind. He had been a little off colour for the past couple of days and he didn’t want to risk him in the heat and humidity of this day. Brenin vehemently disagreed and made his displeasure known, but Mark had a girlfriend looking after him. After an apparently short process of trial and error, Brenin managed to open the garden gate by basically smashing it off its hinges, and charged off after Mark. Since the running route would change from day to day, he must have been following Mark’s scent trail. About 10 minutes into his run, Mark heard a screeching of brakes followed by a loud and sickening thud. He turned to see Brenin lying in the road, having been hit by a Chevrolet Blazer. It had passed Mark a moment earlier travelling pretty fast. Brenin lay in the road for a few heart-stopping seconds, howling, and then he picked himself up and ran off into the woods flanking the road. It took Mark nearly an hour to find him, but when he did, Brenin was largely o.k. The vet confirmed that there were a few cuts and bruises, but no broken bones, and he was back to normal within a day or so. In fact, the Chevy had come off distinctly worse. Brenin’s physical scars healed in just a few days, and the very next day, he was pestering Mark to take him running, and he never showed any subsequent fear of cars that would fly past him on the road. 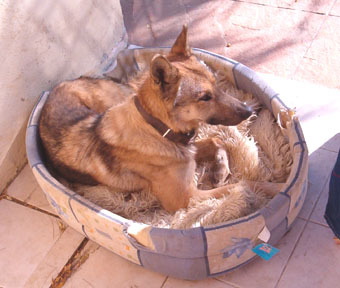 Brenin was a very tough and together animal, both physically and psychologically. A few years later, Mark and Brenin were out running again. They had by now moved to Ireland, Cork, and were running together along the banks of the River Lee. Leaving Lee Valley Park behind them, they headed out into the cattle pastures that lined the river. The cattle seemed inordinately fond of Brenin, and he clearly returned the sentiment. On spring days like this, whenever they saw him, they would stampede up from the farthest corners of the pasture, baying and braying out their greeting. Brenin would trot up to them, giving each one of them a lick on her big wet nose. He may not have liked other dogs, but he really was quite fond of cattle. There were electric fences in those pastures to keep the cattle in, and when they we were on the return leg of the run, Mark grabbed hold of Brenin’s collar and ducked under one of the electric fences. His elbow brushed the fence and the shock passed through to Brenin. He took off in an undignified manner like a scalded cat, and he didn’t stop until he reached the car, a couple of miles away. He was there waiting for Mark when he eventually got back, too, anxious and breathless. They had gone on that same run most days, come rain or shine, for the best part of a year, but Brenin never went back again, refusing point blank, and his decision would remain unchanged no matter what Mark tried to convince him otherwise. The experience with the electric fence was just too much for him. One might think Brenin was just being a little histrionic; after all it was only a mild electric shock, but to Brenin it was a lot worse than being hit by an SUV. Brenin and Mark were inseparable for 11 years. Homes would change, jobs would change, countries and even continents would change, and other relationships would come and go. But Brenin was always there – at home, at work and at play. He was the first thing Mark would see in the morning when he woke, largely because he would be the one to wake him around daybreak with a big wet lick to the face, a looming presence of meaty breath and sandpaper tongue framed by dawn’s murky light. And that was on a good day. On bad days, he would have caught and killed a bird in the garden and wake Mark up by dropping it on his face. The first rule of living with a wolf: always expect the unexpected. He would lie under Mark’s desk while he wrote in the mornings. He would walk or run with him almost every day of their life. He would go to class with him while he did his lecturing in the afternoons. And he would sit with him in the evenings. Brenin never liked to lie down in the back of the Jeep, but preferred to see what was coming. On a trip from Tuscaloosa, Alabama, all the way to Miami, Florida, and back again, he stood every inch of the way with his massive body blocking out much of the sun and all of the rear traffic. But on the day, when Mark and Brenin just drove the short distance into Béziers, near the village where they were living in the Languedoc, he wasn’t standing – he couldn’t, and Mark realized that Brenin was ready to leave. He took him to the place where he would die, but he told himself that if he stood up, even for only part of the journey, he would give it another day, another 24 hours hoping for a miracle to occur. But he knew it was over, that his friend of the past 11 years would be gone, and he didn’t know what sort of person he was going to leave behind. It was not just that Mark loved having Brenin around – although he did. Much of what he learnt, about how to live and how to conduct himself, he had learnt during those 11 years. Much of what he knows about life and its meaning he learnt from him. What it is to be human – he learnt it from a wolf. And so thoroughly did Brenin insert himself into every facet of Mark’s life, so seamlessly did their lives become intertwined, that he came to understand, even define, himself in terms of his relationship to Brenin. Loyal hearts that none could sever. their loyal hearts knew no fear. and her soul mate, man would kill. It was by the bright of day ..
her mate was killed with one shot fired. for her own life, she must run away! she ran on the wind and rejoined the pack. lingers on the wind, then dies. for the mate she had taken for life. The Great Spirit will keep her alive. always searching for her lost soul mate. Things have started to return to normal, although we still miss Aqua every single day. 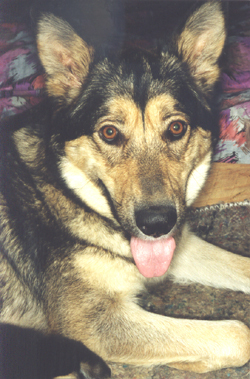 His real name was Annak and he was a multiple wolf subspecies cross. But we must also admit that it is wonderful to see how harmonious the pack is now after there is no old or handicapped member left to care for and look after. It is especially evident in Taima who is now much more relaxed and once again a playful and happy alpha female; it’s quite obvious that having to keep an eye on Annak and guiding him around all the time had been quite a burden to her. The funny thing is that he had always been the one reminding me of feeding times (mostly already half an hour before official feeding time), and now I’m struggling to remember their afternoon meals. It already happened twice that I completely forgot about it until Taima came to remind me hours later. It’s moulting time again, with Taima going through her first full moult at the age of four years, dropping tufts of hair wherever she goes, sits or lies down. She looks like an old rug that is busy falling apart, but since she doesn’t like to be brushed, Ted and I use every opportunity to quickly grab a handful of lose fur whenever she walks past. Vacuuming has become a very difficult task, because this hair is so fine that it sticks to the carpets like a magnet, and I often have to swipe the carpets with a rubber broom to get the hair out and save my vacuum cleaner from sudden death. Kajack II has just turned two years and only loses a bit of undercoat, and Ascar II also only lost some undercoat, but not really much. It will take another year or two before they will go through a full moult for the first time, too. We are experiencing another heat wave (at least the third or fourth this summer), and although we get some good rain in between, the ground is still not saturated. The pack enjoys every rainy evening and night we get, sliding through the mud, digging holes and chasing each other through the garden as if there would be no tomorrow. It’s another thing that makes house cleaning anything but fun. But how do they say so rightly? If you cannot stand the heat, stay out of the kitchen. All in all life is good in the moment, no worries, and Xmas is right around the corner. That means that Ted and I will take a well-deserved break from work, computers and the outside world, just spending time with each other and the pack for a change, and worry about what will be coming our way when it has arrived. We wish all of you, your loved ones and your furry family members, a harmonious, merry, happy and healthy Christmas and holiday season, and a perfect (and hopefully accident-free) start into the New Year.